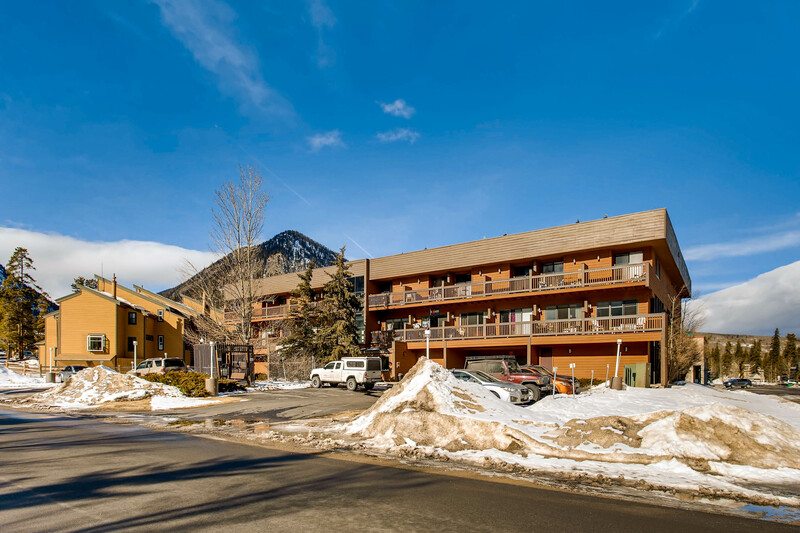 This nicely updated studio, 1-bathroom deluxe condo is an excellent and affordable getaway for a couple or family/group of up to 4. 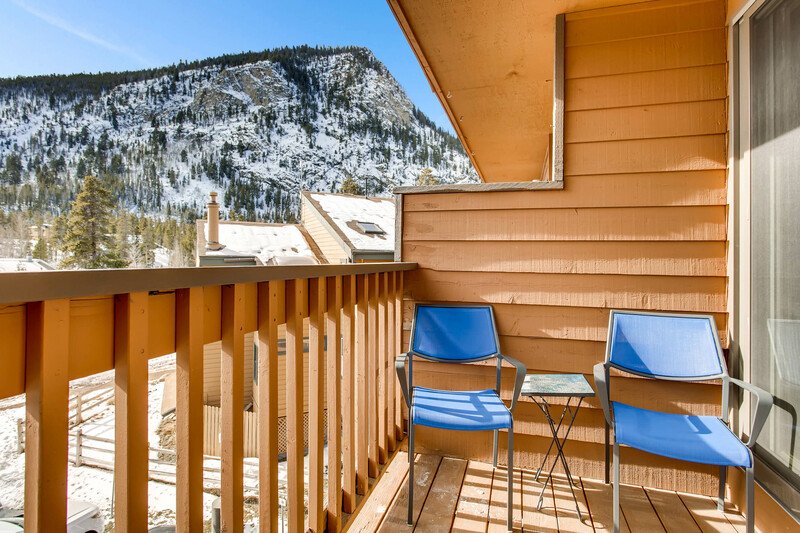 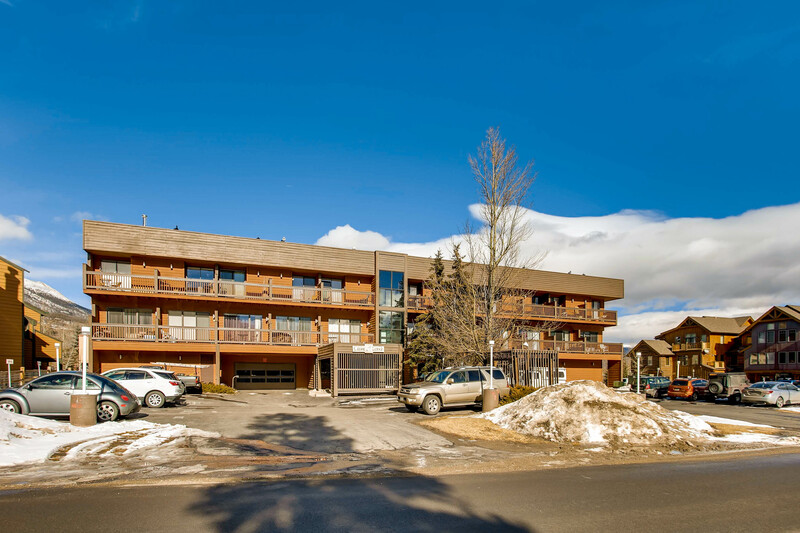 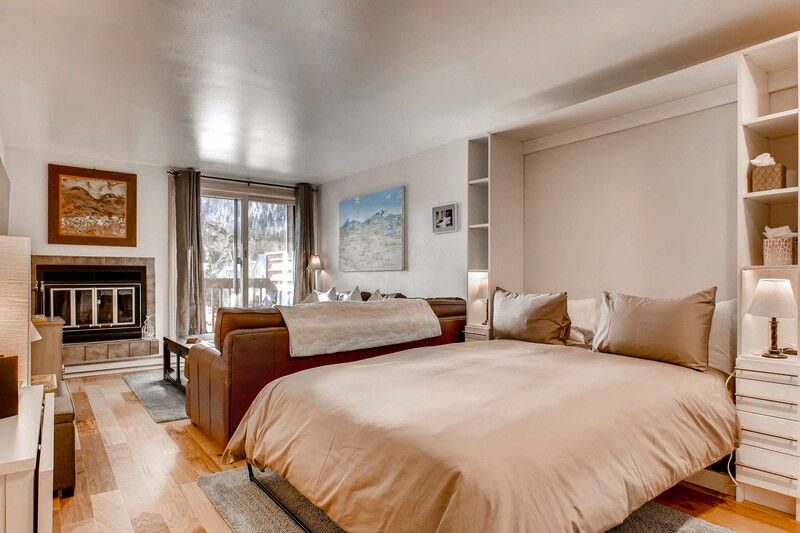 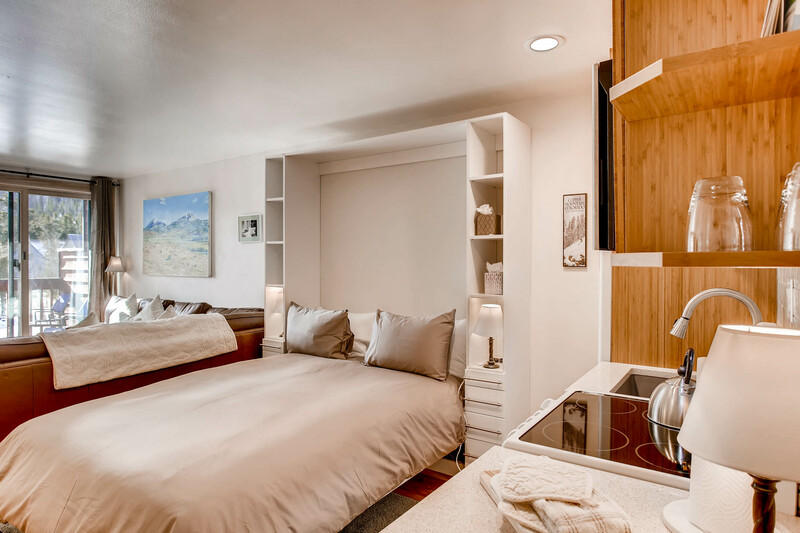 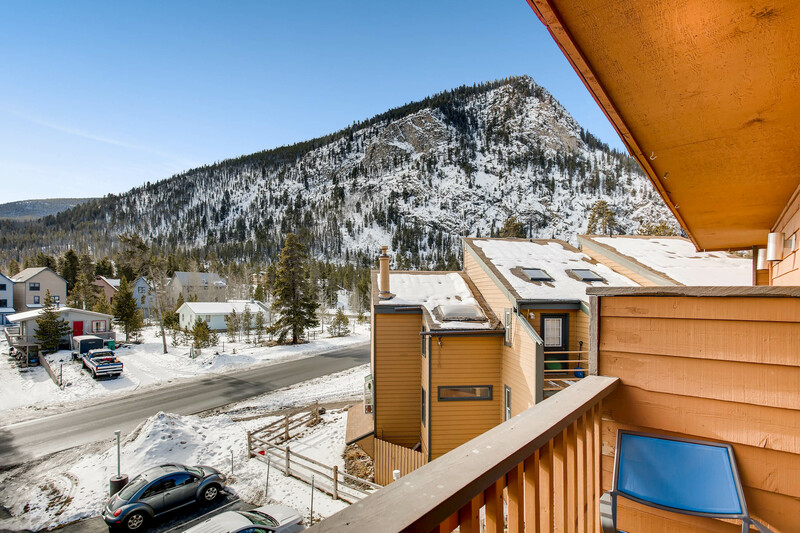 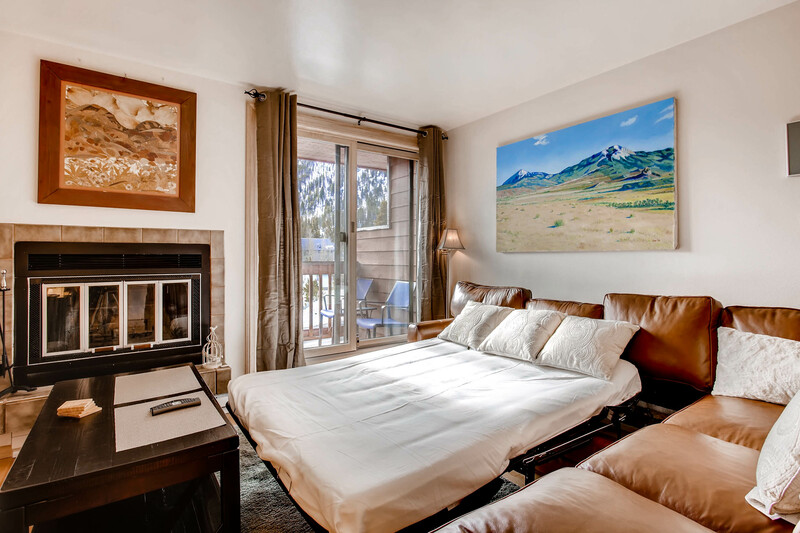 Only a block from shopping and dining in Downtown Frisco and a short drive to multiple ski resorts, this property is a great option for your Rocky Mountain getaway! 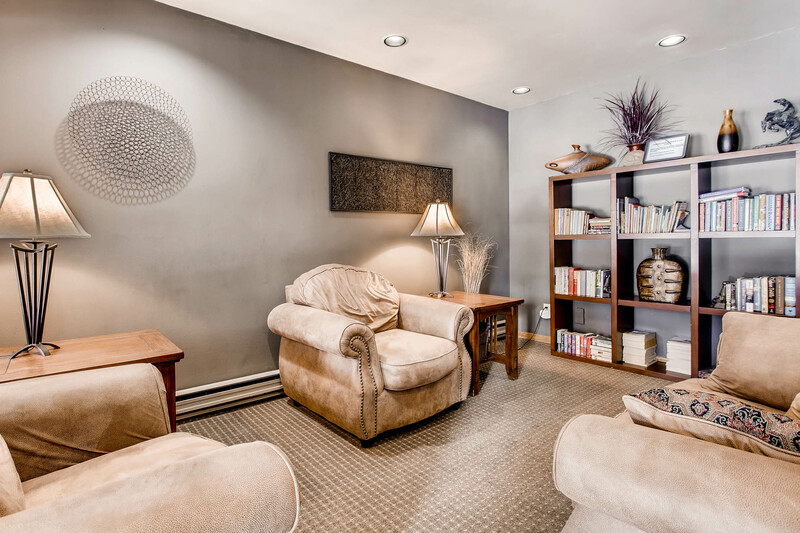 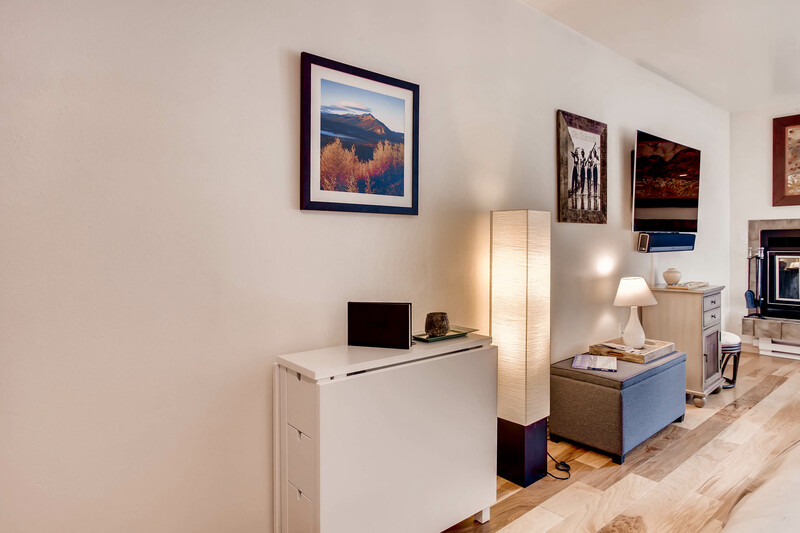 You’ll be pleasantly surprised with how nice this condo is. 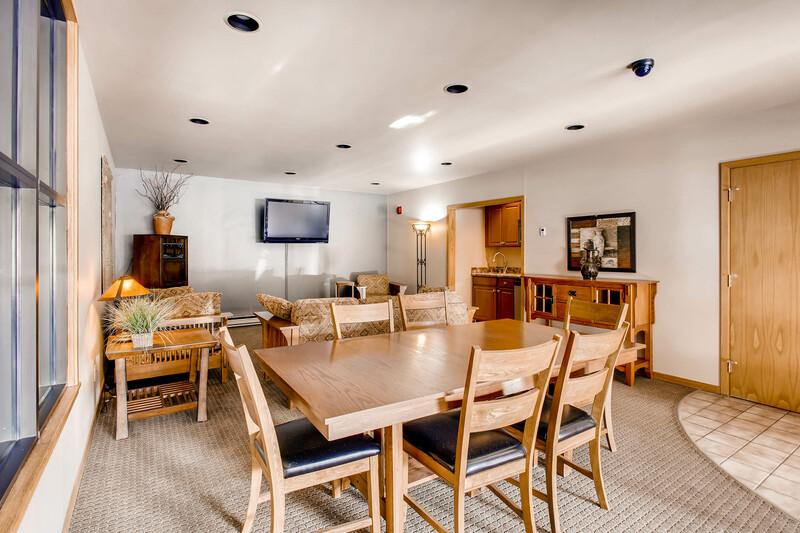 It’s cozy with comfortable and new furniture. 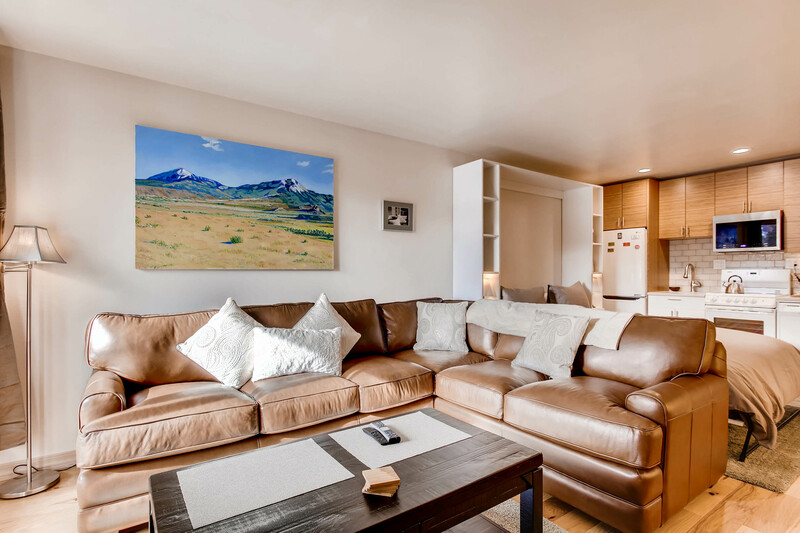 The living area has a leather couch that has a double sleeper sofa hidden away. 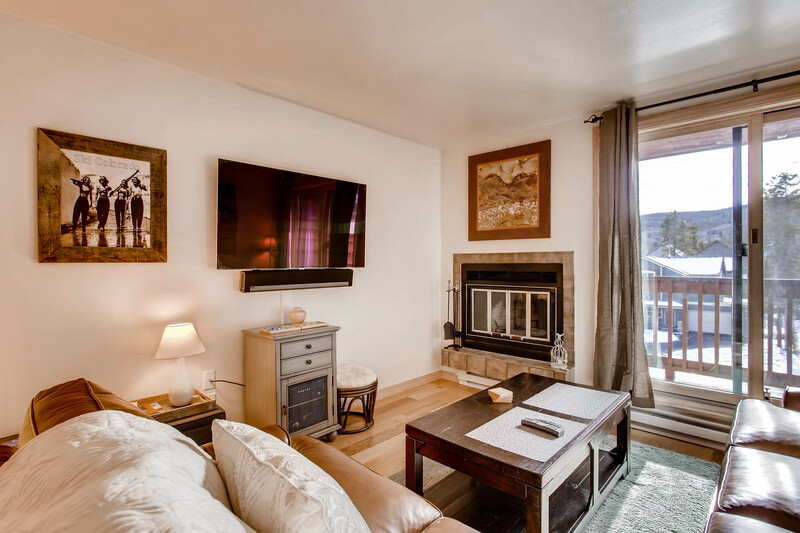 The large LCD TV with soundbar is great for watching the game or your favorite shows and the wood fireplace is a great touch that makes you feel like you’re in the mountains. 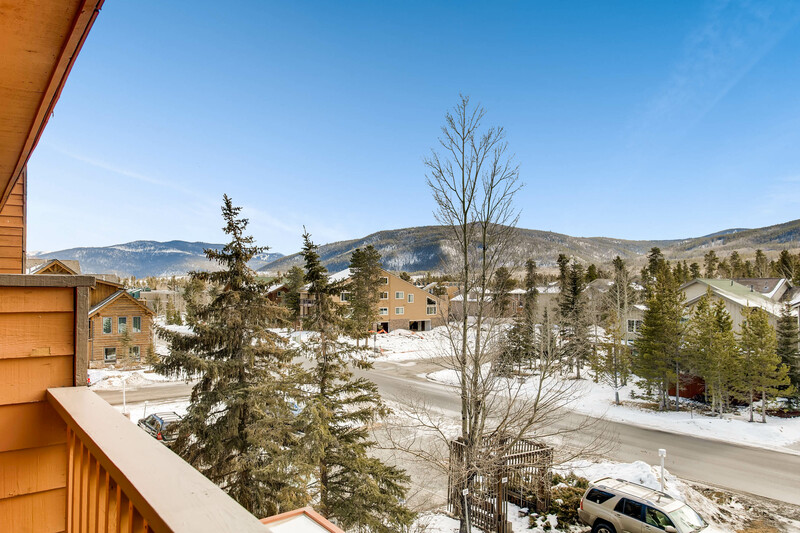 A large sliding glass door provides plenty of natural light and leads to a balcony with superb views of Mount Royal and Tenmile Peak. 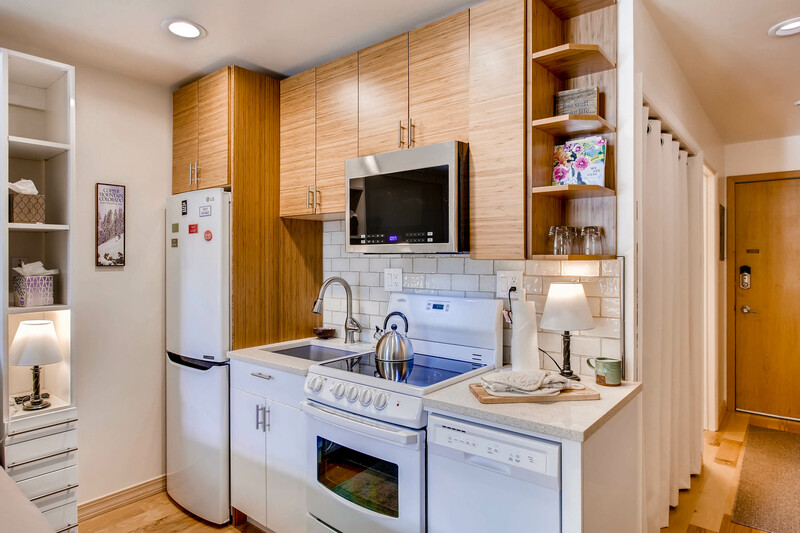 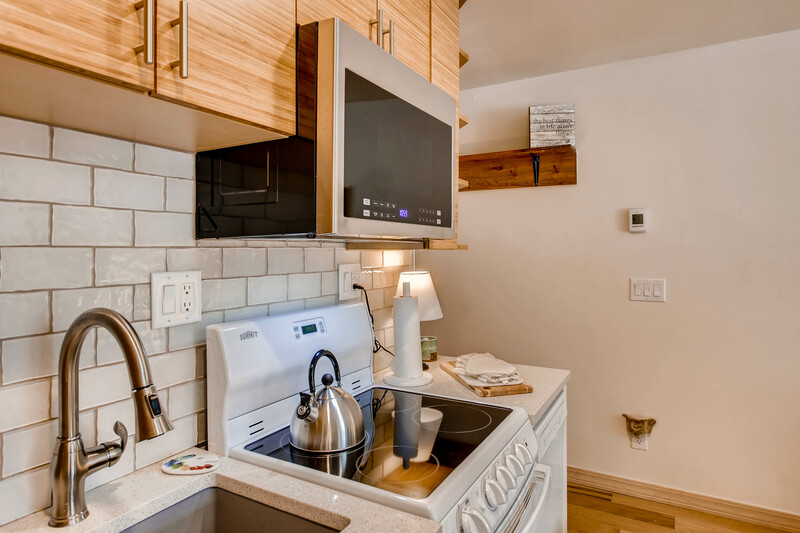 The full kitchen has white quartz countertops and everything you need to whip up a beautiful meal including a stove, oven, fridge, microwave, and dishwasher. 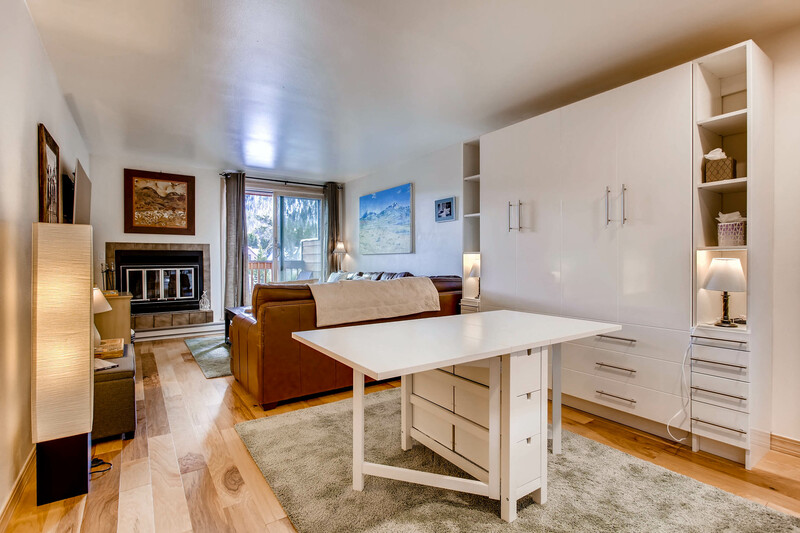 There is a nice table and chairs that make great use of the small space and fold up when not in use. 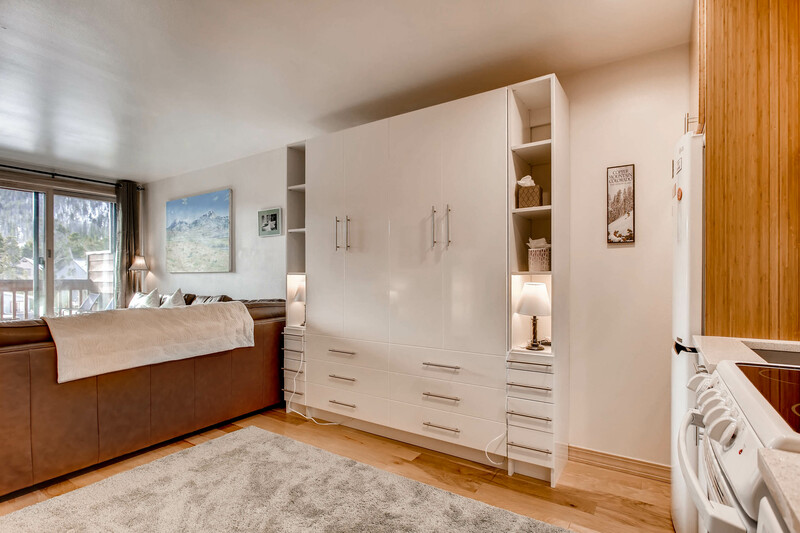 The queen murphy bed is comfortable and easy to fold away when you would like the extra space. 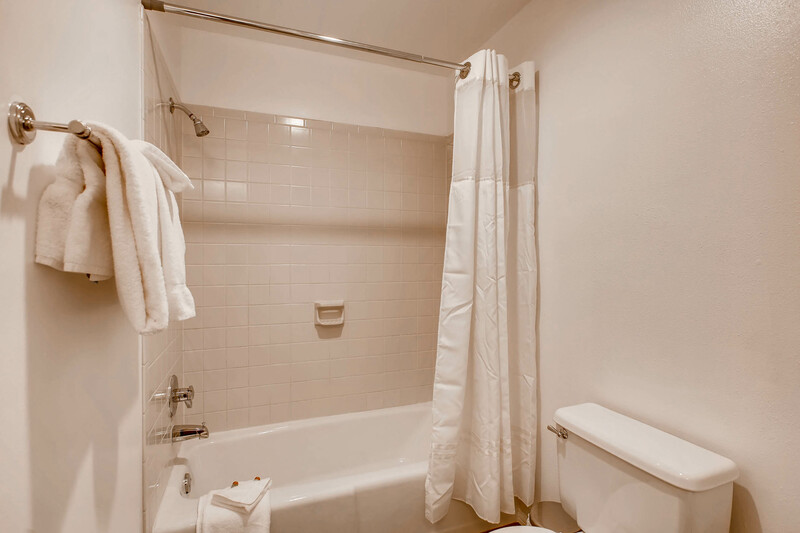 The bathroom has his and hers basin sinks and a shower/tub. 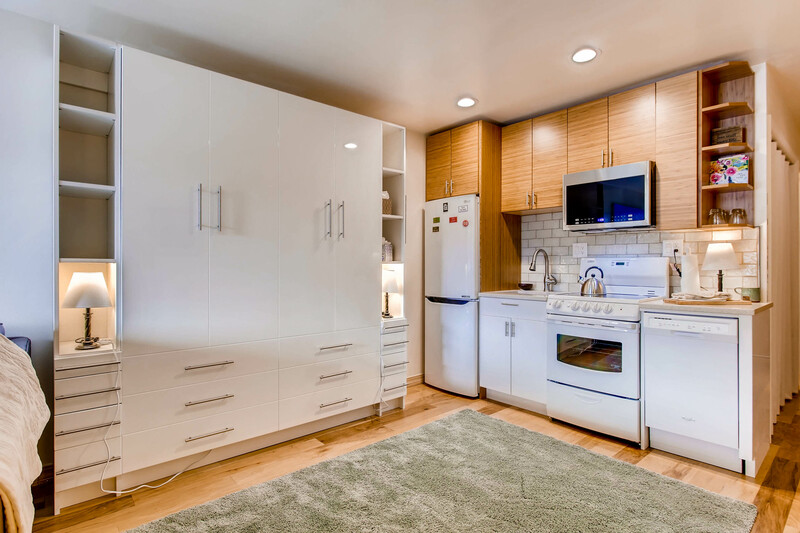 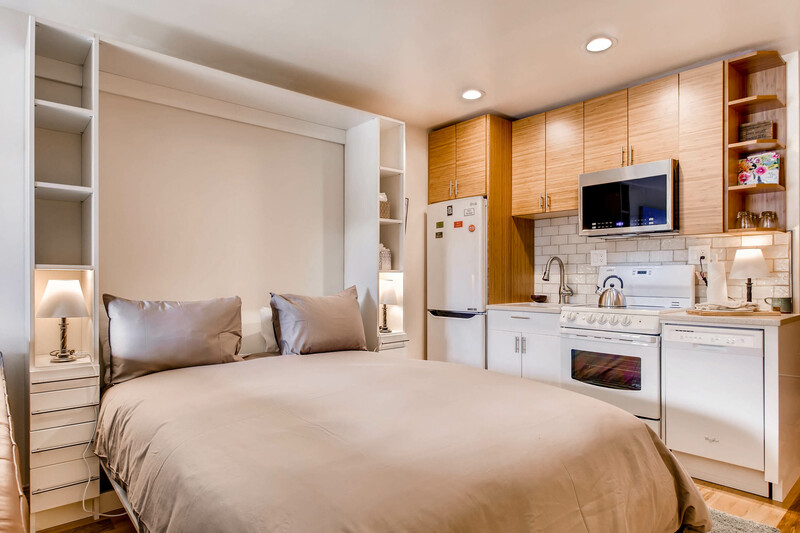 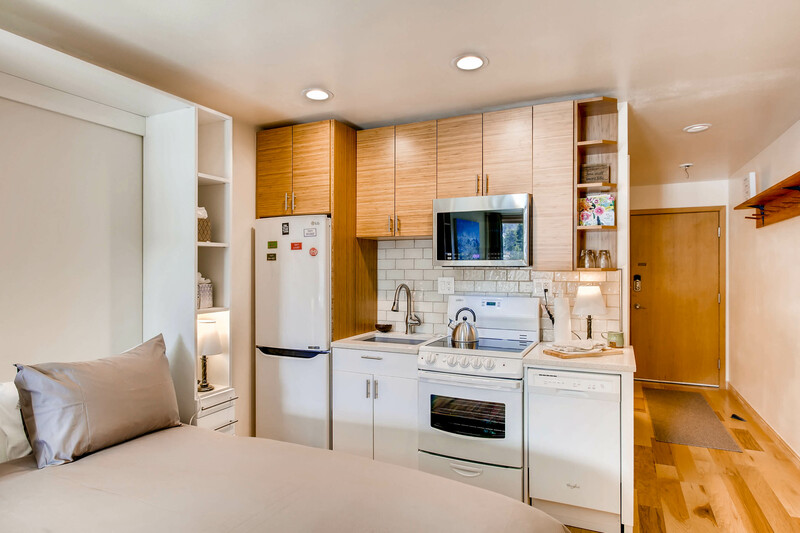 To top it all off, this unit has access to a shared hot tub (Nov.-April only), elevator, and a parking spot in the underground garage! 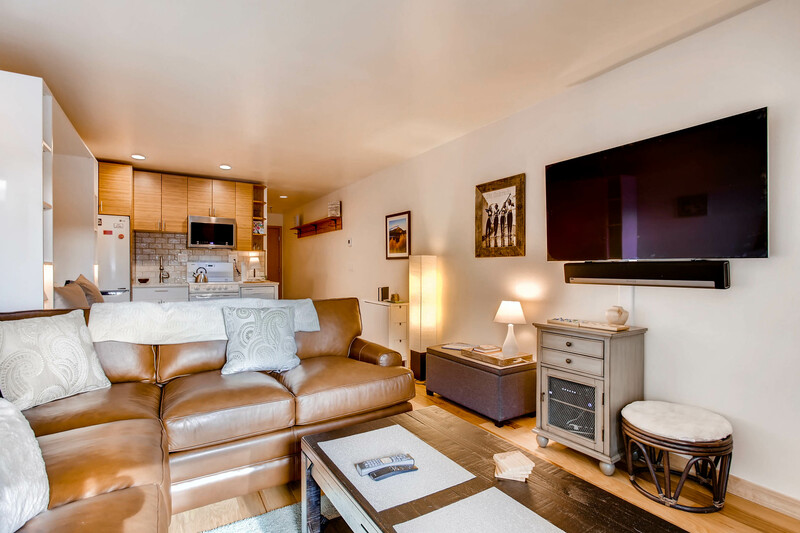 If you’re looking for the perfect place that won’t break the bank, then look no further than Cedars Lodge Studio! 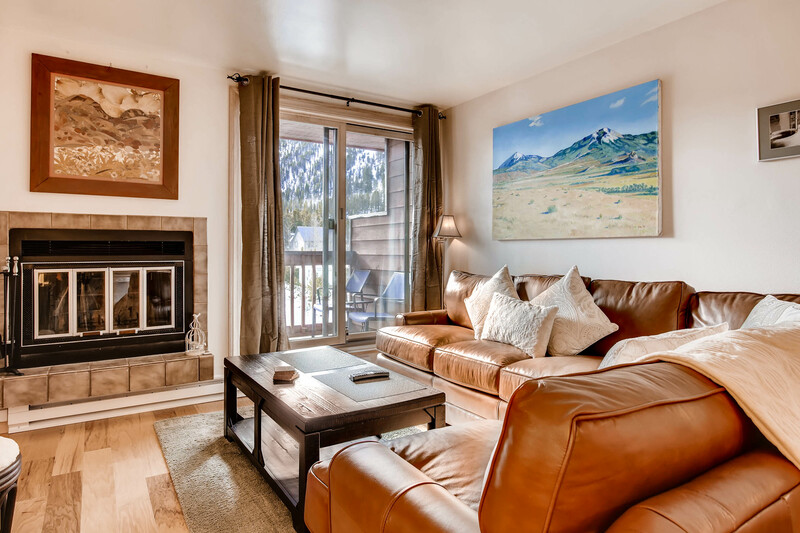 Call us today to reserve your Rocky Mountain vacation in Frisco! 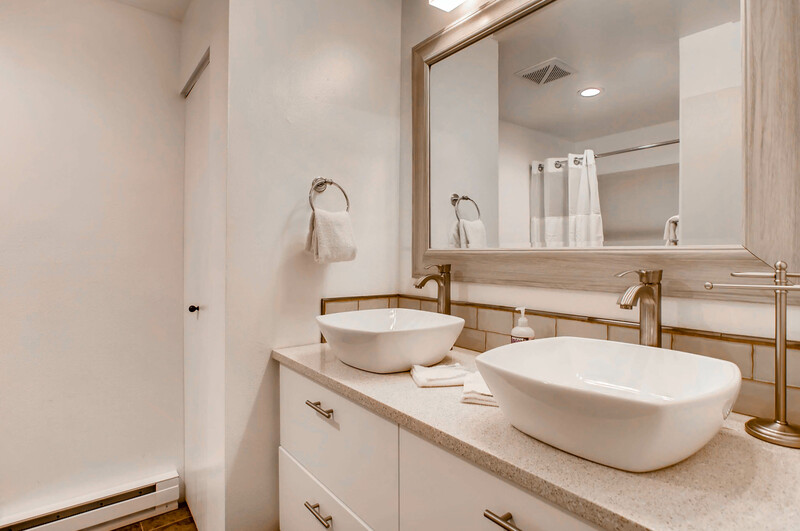 - Bathroom with his and hers basin sinks and tub/shower. 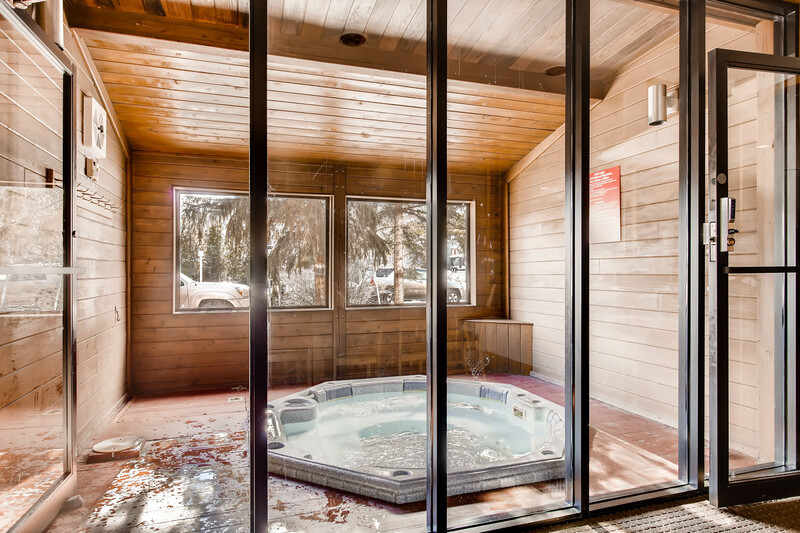 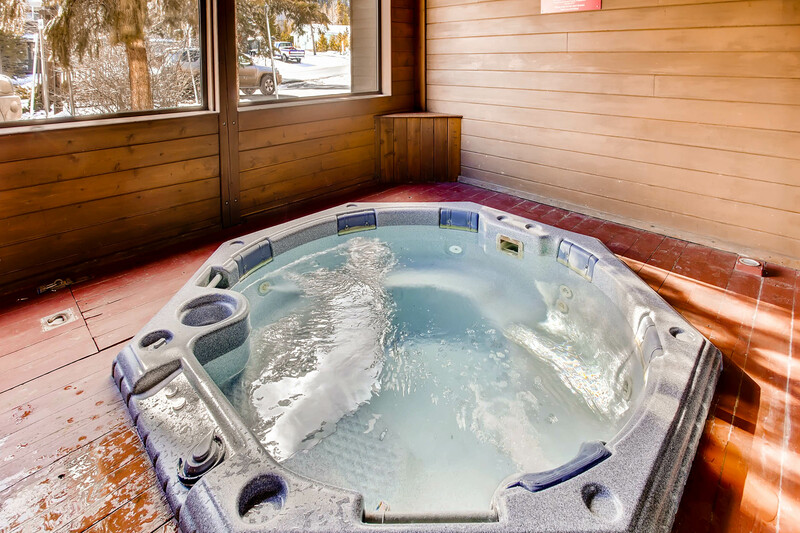 - Shared hot tub access Nov.-April only. 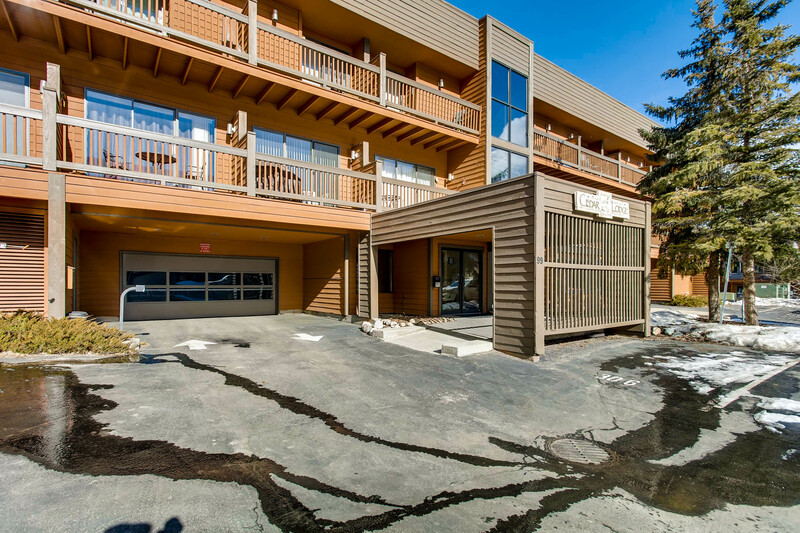 - Parking: 1 space in shared garage. 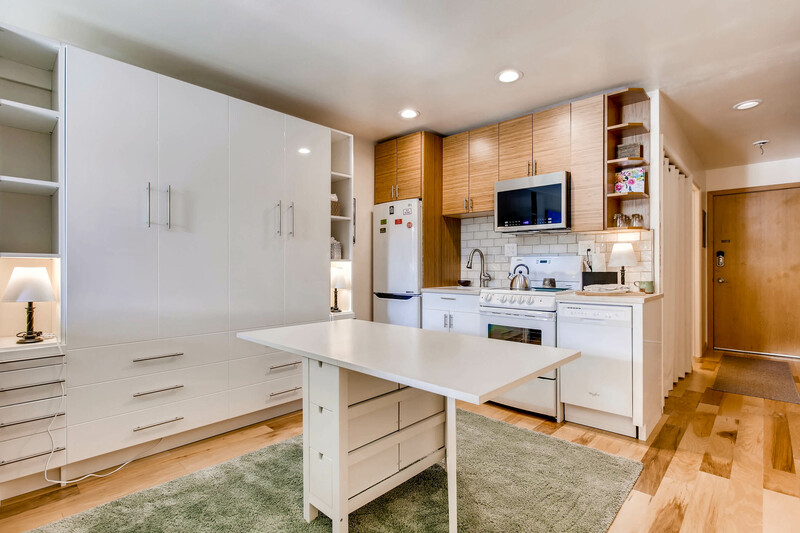 1 space total.